The ends of her flowy chestnut hair brush against her hips. The dark nail polish and multiple cocktail rings on her fingers show off an artistic, creative sense of style. 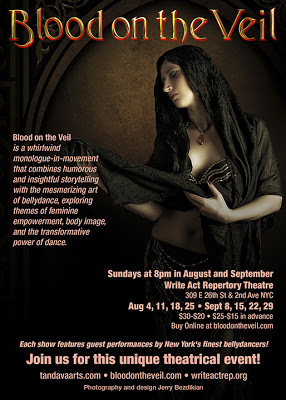 Brooklyn-raised Carol Henning is not your typical belly dancer, or stand-up comedian, or screenplay writer. She is in fact all of those professions at the same time. Her current show “Blood on the Veil,” written and performed by Henning herself, is based on true events of her life as a performing artist. On that day, sometime in the late 80s, Henning discovered the new, giggle-inducing version of herself. So she went out to seek people with similar interests. In 1993, Henning joined a theater company in hopes to gain some experience in stand-up. Over the course of about eight years, she learned about how the theater works and had a chance to try her hand as a screenplay writer and stage manager, as well as the stand-up talent. She is especially proud of the last comedic set she produced there. At that point, Henning learned to adapt to aspects of performance outside of her comfort zone. When Henning was cast in a play as a crazy church lady, her role involved coming out with a chainsaw at the end. The character would usually be played by a petite woman to provoke laughter rather than fear from the audience. Henning knew that her height was not the only quality that set her apart from the other performers. It took three performances of horrifying chainsaw waving, but Henning found a solution. She changed her tone of voice in that scene to a milder, less dramatic note. Next time when the audience laughed, she knew a desired image for her character was established. “The audience is my director,” Henning said. A major turning point came when she had a bad injury, followed by a surgery, which made even simple movements like walking, a heavy chore. Henning felt she was out of place, until she discovered belly dancing. She found that in spite of the difficulty and pain that she experienced at first, the dance made her feel “back” on track. During the next several years, Henning experimented with dancing to poetry and the utilization of movement in storytelling. She always wanted to do a one-woman show about her outer and inner journey. She took a workshop to educate herself about stage productions. Soon the biographical “Blood on the Veil” was created. In the near future, Henning hopes to produce a show about “everything that can go wrong when you’re belly dancing.” It will reflect the comedian side of her persona, with funny jokes and physical comedy.